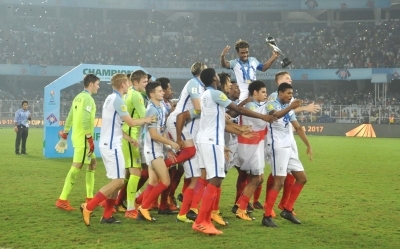 Kolkata, Oct 29 (IANS) With a swagger accentuating their victory walk, elation and pride writ on their visages, the English U-17 squad hoisted their first-ever World Cup trophy after a historic win over Spain at a packed Vivekananda Yuba Bharati Krirangan here. 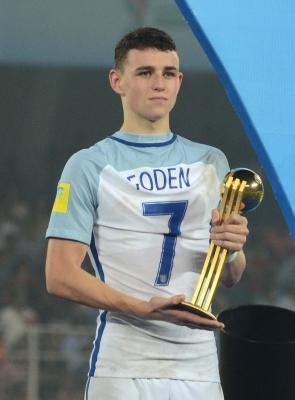 Mass hysteria prevailed at the stadium on Saturday as Philip Foden and Rhian Brewster led the squad in a victory run, arms wide open as if to embrace the trophy, which was brought to the dais by Indian senior team captain Sunil Chhetri to a thunderous applause. Brewster received the Golden Boot for scoring the highest number of goals (8) and the Golden Ball went to the spectacular playmaker Foden while Brazilian goalkeeper Brazao was honoured with the Golden Glove award. Huddles, hugs and kisses rained on the trophy as FIFA President Giani Infantino handed it over to the Young Lions. As it was hoisted by Angel Gomes, the entire squad leapt on one another in a raucous celebration. They clung to it tight and rejoiced under showers of confetti and gazes of millions of fans. Punching the air and patting each other, the team broke into an impromptu dance. Union Sports Minister Rajyavardhan Singh Rathore, West Bengal Chief Minister Mamata Banerjee, AIFF President Prafull Patel and Infantino and other FIFA officials presided over the award presentation. Luck eluded Spain a fourth time in the FIFA U-17 World Cup final and this was clear on their faces. Wiping off tears with their jerseys and trying to cheer each other up, they braved the guard of honour which was arranged by team England in true sportsmanship. With crest-fallen faces, they each went up to the dais for the final felicitation. Brazil was awarded the FIFA U17 World Cup Fair Play trophy. Congratulations poured in from all quarters, including British royalty.